Hello lovelies! 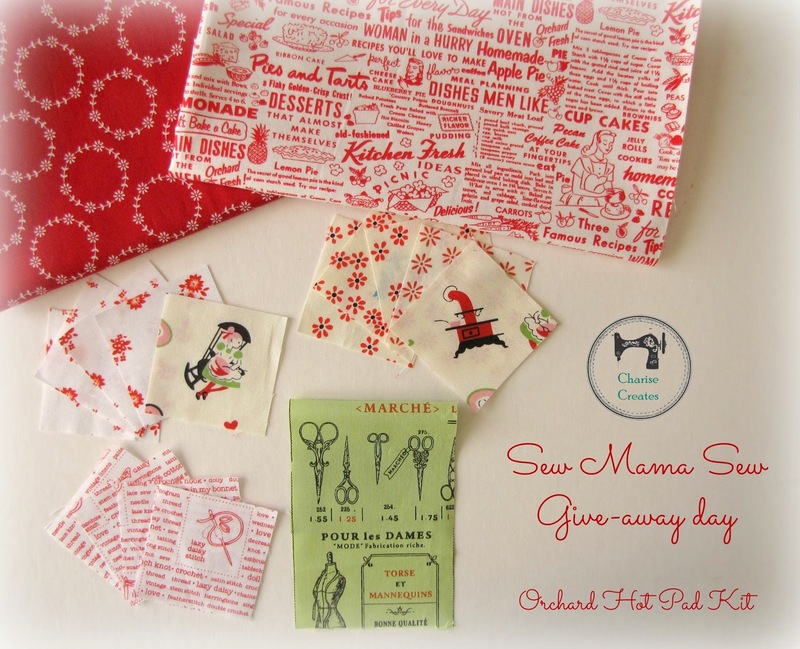 Tomorrow is the start of Sew Mama Sew Give Away Day! I am giving away a fabric kit and pattern to make my Apple Orchard Hot Pad !!! The give-away includes the fabric pictured above. The red print top left is one of my favorite out of print fabrics - "Sweet Broderie" by Rosalie Quinlan for Lecien~ 1/2 yard. The top right fabric is one of my favorite New fabrics - "Recipes for Success" by Holly Holderman for Lakehouse Dry Goods ~ Close to 1/4 yard. You can purchase this lovely fabric at Sew Me a Song . The 2 1/2" squares are a range of some of my favorite white ground prints. And last, is a piece of Suzuko Koseki Notions Fabric for the stem. It also includes a PDF pattern for my new Apple Orchard Hot Pad pattern. Just in time for holiday gift giving. To Enter ~ Please leave a comment below! Give-away is open to international participants. Comments will close on December 13th at 5 p.m. PST. I will announce the winner on December 15th. Sew Mama Sew Give-away day starts tomorrow morning. Head on over for your chance to win some fabulous notions and hand made items from other designers and bloggers. Ooo I would love to win your gorgeous giveaway!!! Thanks for the chance! I'd love to make your fab apple! been eyeing it for quite some time, Thanks for the chance. Would be just thrilled to win...thank you! Qué lindo si salgo favorecida !!! Me encantan sus telas y la manzana! GREAT giveaway!!! Thanks for participating. I love your blog and your patterns! What a lovely prize - thanks for the chance to win! Ooh gorgeous giveaway! The hot pad is just so super cute! Thanks for the chance! I love this - the pattern and the fabrics! thank you for the giveaway and your generosity! Sweet giveaway! Have a wonderful week! The fabrics are great and the project would be fun to make! So sweet! I would love to win the kit. Thanks for the chance. Oh! I love these fabrics and your sweet pattern. I love your hot pad and a kit to make my own would be a great win. Thanks for the chance. My kitchen has an apple theme with an apple clock, apple pictures and verses and even a ceramic apple spoon holder by my oven range. Your apple hot pad would feel perfectly at home here! Thank you for a chance to win! I just love the fabric you are giving away with the delicious pattern. Ooooo....love that new Lakehouse print!!! Beautiful gift you are giving away. Your hot pad is adorable. Thank you for the chance to win. Would love to win your hot pad! It's the best I've seen so far! That is completely adorable, and I love your fabric choices! What a great prize! Potholders have been on my to do list for quite sometime. Thanks for the terrific giveaway. Love the hot-pad. I love your patterns and can't wait to try one! Your apple hot pad is just lovely. Thanks for the lovely giveaway. The apple hot pad is so cute. Would be a wonderful teacher's gift. so totally gorgeous!!! thanks for the chance to win. What a fun giveaway, thanks for a chance!! Love it! I was admiring these on your blog the other day. Thanks for the opportunity! What a fun set of fabrics! The kitchen fabric is fabulous!!! I think I NEED that! :-) some shopping is already planned for later today, ha ha! Thank you for this very cute giveaway!!! Very pretty fabric and cute hot pad. I enjoy your blog cheers to a great week! What a great set of fabrics for a lovely project, thanks for the chance! What a lovely giveaway! Thank you for the chance to win!! I love your apple hotpad! What a great giveaway! Your hot pad and the fabrics that you chose are just darling! Thanks so much for the giveaway! Love the hot pad - thanks for the chance to win the kit. I always love the fabrics you use! I never see anything like them in the local quilt shops, I will have to shop online for them I guess! Thanks for the chance to win! Thanks, Charise, for the chance to win something so sweet. Your work inspires me. Have a great day. Sweet fabrics, of course.... But your apple hot pad is adorable! Thanks for the chance to win, Charise! Please enter me in your giveaway! And thank you for offering your sweet pattern and fabric. Cute giveaway! Nice fabrics and pattern! Gorgeous pattern, gorgeous fabric, gorgeous giveaway. Thanks!!! I can see why the red lecien is a favorite! I love your potholder! What a fun pattern. I love this pattern, Charise! and the fabrics you choose are always perfect! just gorgeous! Fabulous potholder and beautiful fabrics! thank you for being part of sew mama sew giveaway day! How cute! I want to make this for MYSELF!!! I'd love to make the pot holder. What a great giveaway. Thanks so much Charise, this is cute! I've always loved this pattern, Charise, so my fingers are tightly crossed -- thanks so much and happy holidays! This is a great pattern! Thanks so much for the chance to win! I absolutely adore the fabrics you use! Thanks for the giveaway!!! Too Cute, I could make tons of these happy Apps! I could seriously use new hot pads! Thanks for the chance to win your pattern. Love i! Would be a great gift to me too:) Thanks! The pattern is adorable, and the fabrics you have chosen "make it" ever so perfect! Thank you for the opportunity to win! Wonderful apple! I'd love to make this! Love your fabric choices...so cute! I love the red fabric,I'm planning to make a red and cream quilt for my bed so some that might just "go missing" if I win. Lovely fabrics and a great pattern! This pattern is too cute! Thanks for the opportunity to win it. I love kits. Just love them. I frequently have creativity block, so kits keep me sewing while I'm stumped (and I've never made a pot holder before and this apple one is super cute). This is a wonderful pattern! I just love it and my sister would love it more, hehe. Thanks for the give-away! I love these. I feel like I would have to do red apple and green apples! Charise, I love the fabrics and your pattern. Thanks for the chance to win! This is so beautiful! Thanks for the chance! oooh, yours is my favorite giveaway so far! i would love to make this potholder and those fabrics are drool worthy!thank you. See now if I make one of your patterns it will look more like something you made style wise, I seem to add something or take something away that make mine different . Nothing wrong with different but I do love your fabric pairings. This is lovely! I would love to win this! OMG there are so many giveaways my fingers are starting to hurt, I'm guessing it's because they are crossed so tight hoping I'll win something good....hehe! Love, love, love the red and white retro! Would love to win! 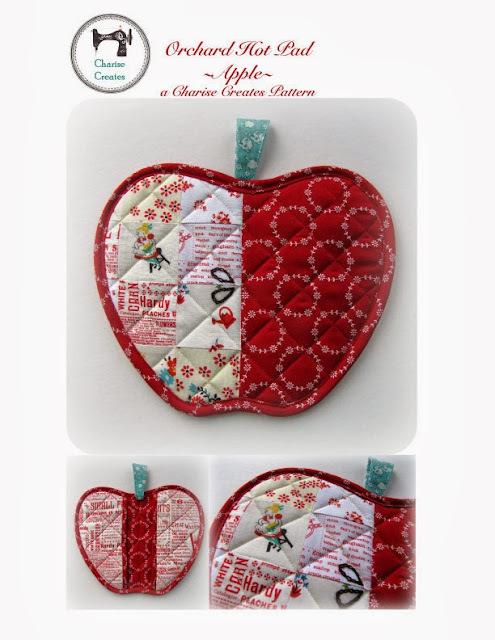 I love your apple pattern and the fabric you've selected for the giveaway is awesome. My kitchen is decorated in apples. I would love to make this pot holder to add to the collection! Cute! Know just the special person I could make that for. Perfect fabrics and pot holder design! cute that would go in my kitchen sew well. I think that apple potholder is so cute. Perfect shape and great fabric choices. would love to win it. Thank you for the chance - I think your patterns are so creative. I love making pot holders and have been making them to be gifted and I make them for our church bazaar but should I win, this one would be for me.The fabric is fabulous and the apple is so cute. Merry Christmas to you and your family!! That is such a generous and beautiful giveaway. I'd be thrilled to win these choice fabrics and your sweet apple pot holder pattern. Thanks for the chance to enter this giveaway. This looks fun to sew. Thank you for sharing the fabric and your pattern! I love this design and have been pondering a purchase! It would be great to win it though! Oh I love your pattern, and the fabric is fabulous. What a great prize. Lovely fabrics. Thank you for the chance to win. Thank you for the opportunity! Gorgeous! What a cute little kit! Thanks for offering! Precious! LOVE this fabulous pattern! Thanks for the opportunity! I've been seen this on Instagram , now to have a chance winning the giveaway ... it must be my dream ; so gorgeous ... !! What a wonderful kit. Love your apple! What a fun kit with great fabrics! Thanks for the chance at your giveaway. Thanks so much for the chance! My kitchen is all red apples so this would be GREAT! Fingers crossed! What a fun pattern and gorgeous fabric! ohhhh this is so great. I would love to win! What a sweet pattern and gorgeous fabrics!! Love the fabrics. Cute pattern too. Sure would like to win. This whole package is adorable! This is such a fun pattern - thanks for the chance! It's all so cute I can hardly stand it!! Thanks for the chance to win!! This is so cute I can't stand it. And what a lovely treat of fabric scraps to -- wait, I did not read Karen's comment, I swear. I didn't even see it subconsciously. Oh, grrrr. She stole my comment in advance. Anyway, those scraps are just delicious. I'd really love to win -- thank you! Lovin' the red and white. I've been stashing red/white fabrics for an undetermined project. I love your prize. It is so cute! I love both the fabrics and the pattern you've chosen so thanks for giving them away and the chance to win! Oh, that's pretty. Thanks for the chance to win such a nice giveaway. What a lovely giveaway bundle, thanks for offering! Eeep, that is so cute! I love that red fabric - I'm having a bit of a thing for red at the moment! Thanks for the chance to win! Now that is just darling! I would love to win your giveaway!!! Thanks for the chance! I LOVE all these fabrics!!! Would love to win! This is a lovely giveaway - thank you. I could do with making some hot pads and so this would be just wonderful! Love this potholder! Thanks so much for a lovely giveaway! What a unique giveaway! I just favored your Etsy shop. I love some of your patterns! Normally I would applique something like them, but I think I want to learn to quilt them instead! They are very original and interesting! Love this little "orchard" hot pad set! It would look lovely in my kitchen. Thanks for the giveaway Charise! I'd love to make one of these beauties! That is such a cute potholder! I would love to make one. Cute potholder. Thank you for the chance to win. What a great potholder! Thanks so much for the chance. I need some more potholders, but that is too pretty to use (almost)! Oh how adorable - thank you so much for a chance! Fabulous! I love the colours! Love it! Thank you! crossing my fingers! I love apples! I have 15 trees - love to press the cider. Hello from cold & white Calgary! Very cute! Thanks for the chance to win! Love apples! Thank you and Merry Christmas! Oh, this is so cute, and would be absolutely perfect for my kitchen! I adore that fabric! You make the cutest stuff! Thanks for the giveaway! My current hot pads are so nasty...really need to make a cute one! Oh my! You are so generous! I adoooooore all your patterns! And these fabrics that you are giving away are simply gorgeous!! thank you Charise! I would love to win this, it is adorable, thanks! oh, such a sweet giveaway. thanks for a chance. Merry Christmas! Oh that is just adorable! Thanks for the chance to win! These hot pads will coordinate perfectly with an apple wall hanging I made for my daughter! Thanks for the chance! I would love to win this fabric and potholder instruction. Thank you for sharing. That little apple is so cute and the fabrics are wonderful in it. this hot pad is super CUTE!! Thanks for the chance to win! what a super cute apple hot pad! Love it. Thanks for the giveawy. Such cheerful fabric! Thanks for the chance to win! that is so cute and would love to make one! Such a cute apple! And I love the fabric! Wow, that is a beautiful bundle of good stuff! I really hope I win! I love love love this fabric and the hot pad is absolutely gorgeous!!! That's an adorable pattern! And sweet fabrics to make it! Thanks for the chance to win. This is such a sweet giveaway!!! I'd love to win! Thanks!